In 2014, the Transportation Association of Canada (TAC) celebrated its centennial anniversary. Over its 100 years, TAC has worked behind the scenes to support the development of Canada’s transportation system, most recently focusing on roadways and highways. As a way to celebrate TAC’s centennial, we created the Transportation 2014 campaign to remind Canadians that transportation – in all its forms – remains crucial to our nation’s success. In reaching this milestone, we celebrated the past, present and future of transportation in Canada by inviting our members, partners, key transportation stakeholders, and students to take part in this year-long campaign. Public Service Announcement – A 30-second public service announcement was developed and aired in both official languages across Canada to raise awareness of the role of transportation in Canada’s economic and social well-being. Transportation 2014 Showcase – The Transportation 2014 Showcase, a museum-style exhibit, was held in Montreal, coinciding with the 2014 TAC Conference & Exhibition, September 28-30. The Showcase was themed as a trip along the TransCanada Highway, and featured transportation successes and challenges faced by Canada’s provinces, territories and municipalities. Specially-produced videos also offered insights on transportation-related issues and sectors, including Aviation, Trucking, Railways, Bridges and Tunnels, Ports and Seaways, Roads and Highways, Road Safety, and Sustainable Transportation. An online version of the Showcase featuring historical and current images provided by TAC members was developed. 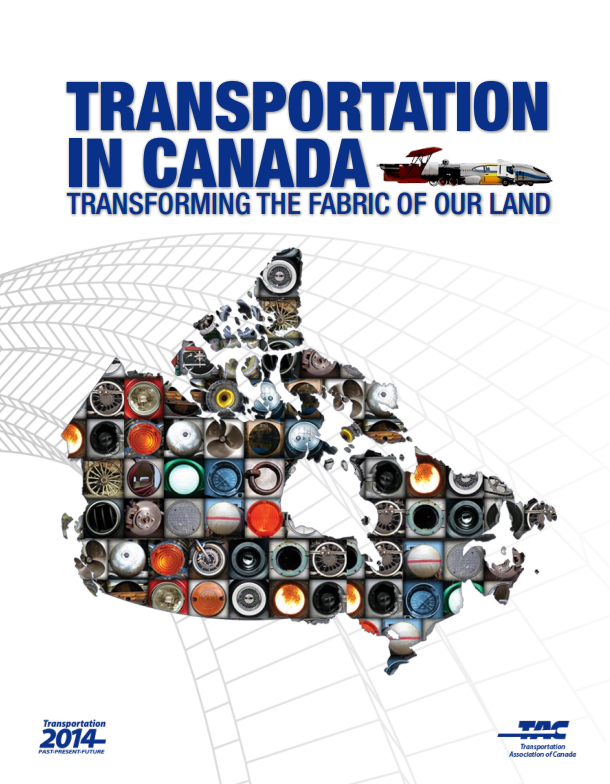 Transportation in Canada: Transforming the Fabric of our Land – This book, guided by a steering committee, and written and edited by a series of subject-matter experts, highlighted major components in the development of Canadian transportation over the past century. It is available as a free download, in PDF format, in both English and French. 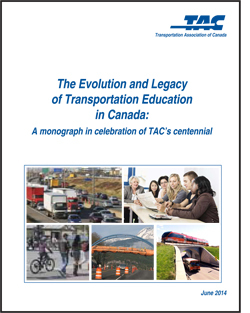 The Evolution and Legacy of Transportation Education in Canada – This monograph project, sponsored by TAC’s Education and Human Resources Development Council , was written in honour of both TAC’s centennial anniversary in 2014 and the transportation community. Cross-Country Lecture Tour - Five lectures, hosted with the support of local partners and educational institutions, were held in Halifax, Vancouver, Calgary, Toronto and Montreal from March through September. Experts discussed and debated topical issues, impacting both the transportation community and the Canadian population. TAC Centennial Video – In this video, key volunteers from the Transportation Association of Canada's Board and councils provided insights into the association's past, present and future. Uncut versions of all of the volunteer interviews are also available on the topics: What is TAC? ; Why be part of TAC? ; TAC’s Accomplishments; TAC’s Evolution; and TAC’s Future Challenges. We thank our 20 partner organizations that provided substantial financial support to the Transportation 2014 campaign.